In this I.M.B.A. academic year (2016-2017), I had the pleasure of attending seminars, as well as at the training course, of Combat Muay Boran, of Master De Cesaris. 77 techniques, exclusively offensive (chern muay) have been collected in a single form. More precisely there are 20 techniques of fists, 16 of kicks, 12 of knees, 17 of elbows, one of the head and for a great ending, 11 techniques of projection and breakage, tum tam chap hak. The whole form was structured in four sections: one for each main weapon (punches, kicks, knees, and elbows). In turn, each section is divisible into four blocks according to how the single weapon is used (for example, the punch section is divided into: straight, uppercut, roundhouse and mixed strikes). This form has been studied and made so as to be extremely versatile: in fact, every single block of each weapon can be combined with any of the others. To make it all clearer, in my opinion, a block can be compared to a musical arrangement: as the agreement is made up of several notes, so a block is made up of several techniques. Then, by performing the different chords in succession, you can always make new symphonies. Though techniques are conceptually all offensive, within them, more or less easily, many refined defense strategies, or Kan Rab, can be detected; this make Combat Muay Boran, an all-round system. Deeply studying this form allows you to develop unique martial skills, useful in the most varied conditions: from personal defense to ring application of the techniques that once belonged to Fi Meu, the most skilled and stylistically refined fighters. 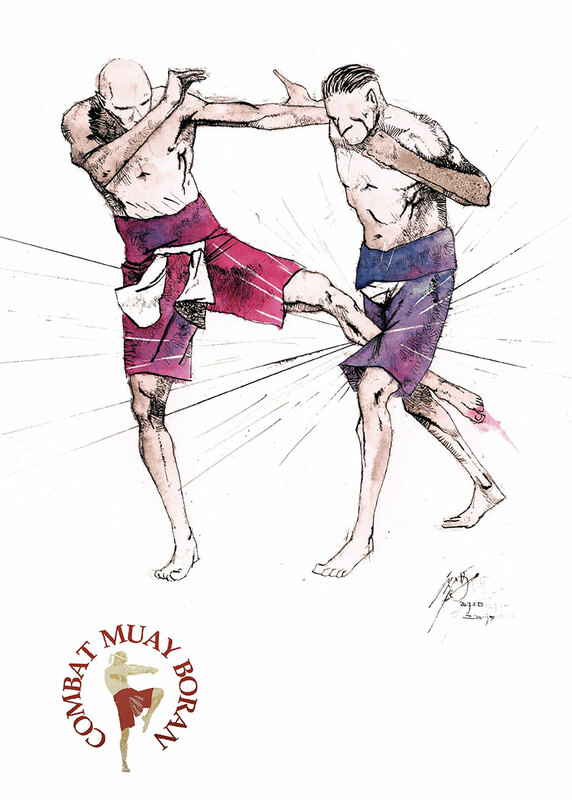 Although Combat Muay Boran is condensed in a single form, it systematically encapsulates the enormous tradition of Muay Boran; In fact, inside of it, there are distinguishable traits typical of different styles, just to make some examples, you will notice the long distance movements of Muay Korat and the circular style of Muay Chaiya. Combat Muay Boran, developed by Grand Master De Cesaris, is the sum of Muay Thai’s most likely successful strategies that can be applied in a clash with two or more people. Therefore, by studying this method all enthusiasts will be allowed to enter, deeply and scientifically, the wonderful world of Muay Thai Boran.